British Museum, London. 200 B.C. This relief shows a scene of an offering where the Pharaoh Ptolemy V offers the spiritual inner eyes of Horus, to Horus, seated on the throne. 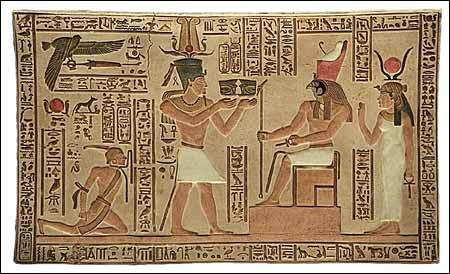 Horus was the son of Isis and Osiris. They form the fundamental triad of the Egyptian religion. Traditionally, Horus is considered the first Pharaoh of Egypt and at later times, the spiritual King where the Pharaoh is only his representative. This sculpture originates from the Ptolemaic period which began when Alexander the Great conquered Egypt from the Persians in 332 B.C. The Pharaohs of this period were Greek but even so they not only respected the Egyptian traditions but also dedicated large funds for the reconstruction of many temples especially in Upper Egypt like the temple of Hathor at Dendera, the temple of Horus at Edfu and the temple of Khnum at Esna.